This Greek Layer Dip is not only to-die-for delicious, but also a great healthy appetizer that feeds a crowd. It comes together quickly with only a few simple ingredients and has all the fresh delicious flavors you love in greek food! 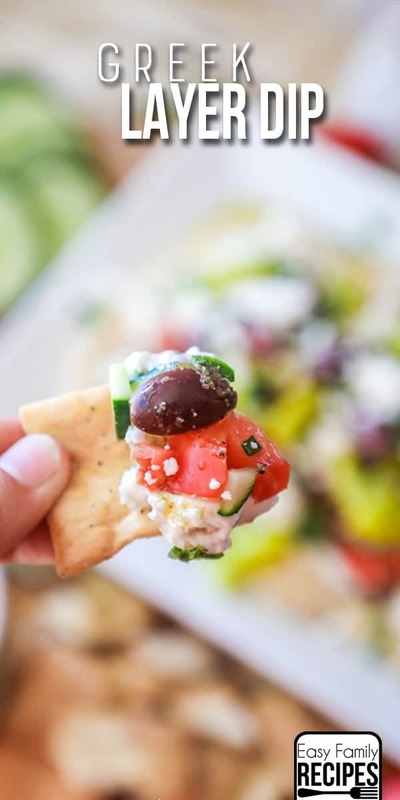 Greek Layer Dip is perfect for everything from nicer parties where it can be dressed up to tailgating where you can dip anything and everything in it. 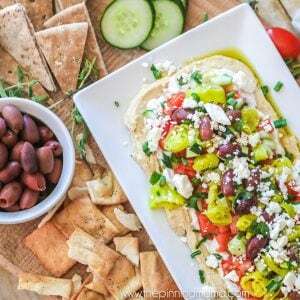 If there is one thing that I can’t get my mind of off this week, it is this Greek Layer Dip! Guys! I was craving it, I made it and I ate almost the whole thing MYSELF! Then I just keep thinking about it, so I think it will be making another appearance at party we are going to this weekend. 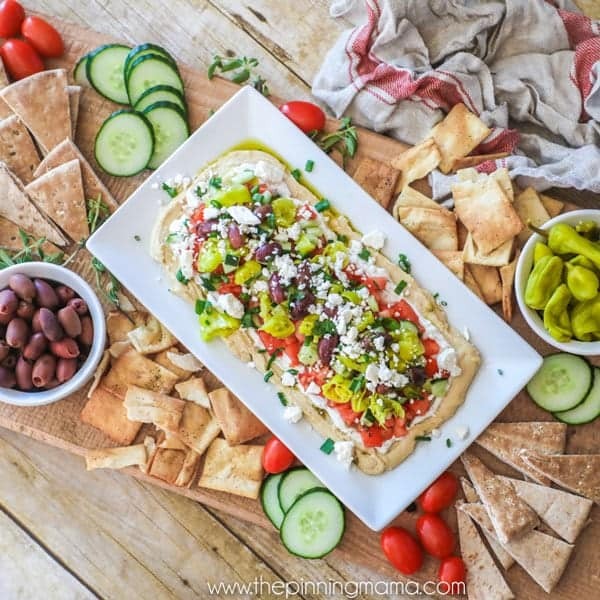 If you like greek flavors, this dip will be your new best friend. Guaranteed! I love that not only is this so crazy delicious but it also much lighter than most party dips and full of wholesome, good for you stuff like hummus, tomatoes, and cucumbers. The little drizzle of spices and olive oil at the end brings everything together. If you need more party dips make sure to check out my Green Chile Dip I shared last week! Another delicious option! Now let’s talk about this presentation people… All humility aside, isn’t it super impressive? It looks so fancy but in reality, this whole set up can be thrown together in probably 20 minutes, including making the dip. I promise and I will walk you through it step by step so you can create something just as swoon-worthy just as quickly. To start, you will want to make this dip on a nearly flat platter. If you don’t have a platter, no need to go out and buy one, you can just use a large plate to get the same effect. Follow the recipe below to make the dip which will be your centerpiece. Next you need some sort of fairly large board to set this all up on. I got mine in the picture on my trip to Magnolia market this summer which was so much fun. If you aren’t right around the corner from Waco, though, which I assume most of you aren’t you can just garb a big piece of raw unfinished wood from the hardware store, then clean it up, or if you just want to use what you have around the house, try using your biggest cookie sheet. You can either lay them straight on the board, group some of them in small bowls like I did here, or lay down parchment paper and put it on there. Once you place everything around the dip, use fresh herbs like oregano or thyme to garnish it and pull the whole look together. There it is! Quick, easy, beautiful and surprisingly delicious! I am going to walk you through how I make this recipe step by step here sharing all of my notes, preferences, and suggestions. You can follow along, or if you just want the quick version, feel free to scroll down to the recipe card at the bottom of this post. This dip is quick, easy and fresh. 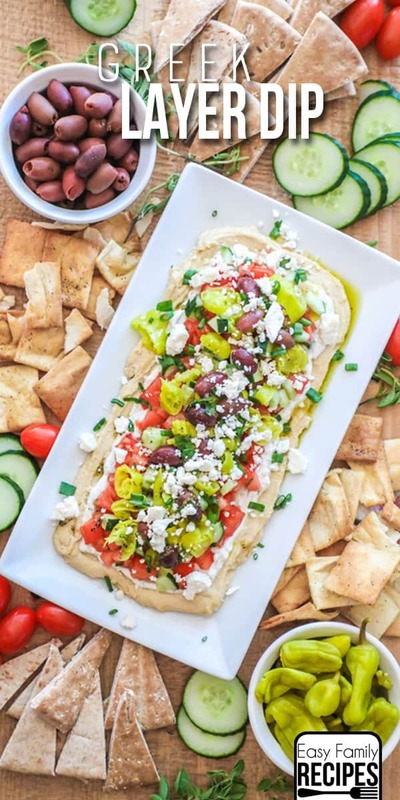 I originally was going for a spin on seven layer dip, but when I was brainstorming what to put in this, there were nine absolute musts on the list, so the name went from 7 Layer Greek dip, to Greek Layer Dip. I think all of these flavors go exceptionally well together, but if you don’t like one or two of them, feel free to leave them out, or if you really love something add some more! The beauty of this recipe is that you really can’t mess it up, and it is all about putting those fresh delicious flavors together, so use your creative liberties! 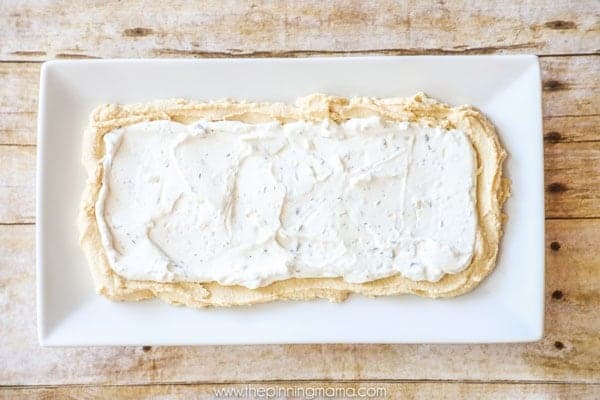 1 container original flavor prepared hummus– I use a 10 oz container of store bought hummus. You will want to find the regular, or original flavor so that you don’t have too many competing seasonings going on in the dip. 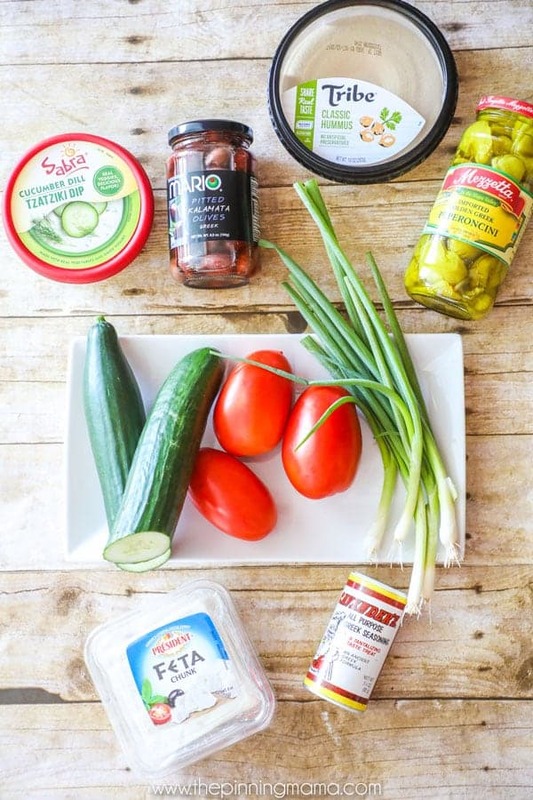 1/2 container prepared tzatziki– You can also find tzatziki dip near the hummus in most grocery stores. They are also usually in 10 oz containers and I used about half of the container. If you can’t find it in the store, or just prefer homemade, it is super easy to make at home. Try this recipe for homemade tzatziki here. 1-2 roma tomatoes, chopped- Since this is a dip, I like to chop these pretty small, around 1/4″ pieces. To chop quickly, use a sharp serrated knife to cut off one end of the tomato to make it flat, then turn the tomato over (flat side downand cut both ways (like making a grid) then turn the tomato on its side and cut through to chop. This method makes chopping tomatoes much quicker and easier, just make sure to use a serrated knife so it cuts easily. 1/2 cucumber, chopped- Chop the cucumber in roughly equal size to the tomato. 5-6 peperonchini peppers, sliced- These are usually near the olives or in the ethnic food section of the grocery store. You can sometimes find them already sliced but if not, just buy the whole ones and it only takes a minute or two to slice the amount you will need for this recipe. 1/4 cup kalamata olives, sliced- I actually just halved mine since I don’t love olives, so that makes it easy to eat around, but to make it a bit more bite sized you could chop or slice them. 3 green onions, chopped- You will also want to chop these pretty small so you don’t get any overwhelming onion flavor in there. When they are small they really perfectly enhance all the other flavors going on! 1/4 cup feta cheese crumbled- You can use a block or pre-crumbled feta cheese for this. I also sometimes add more since I really love the feta flavor throughout. Also, feel free to use low fat feta in this recipe. It still has good flavor and works well so it is an easy way to save a few calories if you want. 1 tsp greek seasoning- I either use Cavenders Greek Seasoning or this homemade Greek Seasoning. You can usually find Cavender’s at most grocery stores on the seasoning asile. It is in a yellow bottle with red and black writing or you can have it to your door in a couple of days from Amazon. 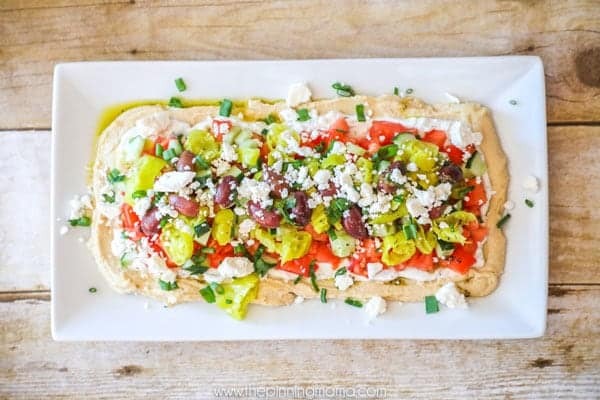 On a mostly flat platter or plate, spread the entire container of hummus out in a thin layer. It will probably be about 1/2″ thick once spread. 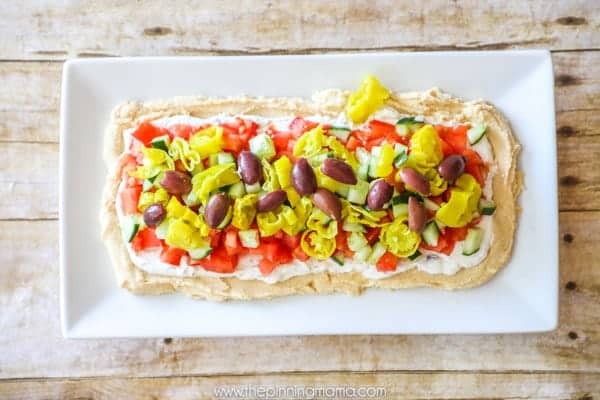 Then spread about half of the container of tzatziki in a think layer on top of the hummus leaving about a 1/2 inch border of hummus just like in the photo above. Next layer on the tomatoes, cucumbers, peperonchini peppers, olives, green onions, and feta cheese leaving a small border on each layer. With all of these you can use more, less, or omit based on your taste preferences. Start layering and get a bit smaller with each layer if you want to get the same outcome as the photos. 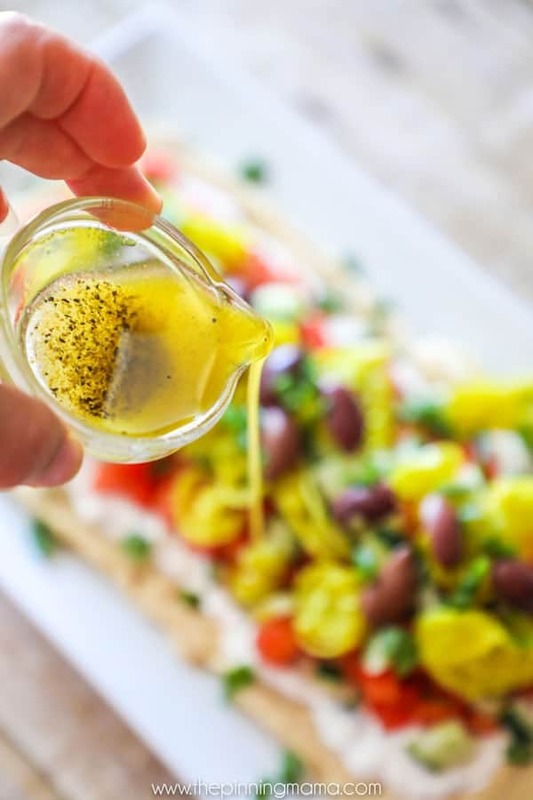 Mix the olive oil and seasoning together then drizzle over the top of the dip letting it drip down the sides and settle on the hummus. Chill for up to 3 hours. Serve with pita chips, pita bread triangles, cucumber slices, bell pepper strips, etc. ENJOY! Man just looking at these pics as I write this makes me crave it again! I really hope that you enjoy this as much as I do! If you get a chance to make it, I would love for you to leave me a note in the comments, or snap a pic and share it on your Instagram feed or stories and tag me @easyfamilyrecipes so I can see what you are making! 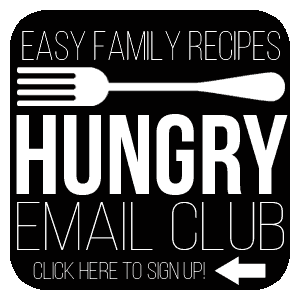 If you are like me, and need a regular rotation of recipe inspiration, then the VERY best thing you can do is sign up for my e-mails (for FREE!) to get a note in your inbox on what new recipes I have cooked up lately and some meal planning ideas for the week. To sign up, click here, or on the button below. 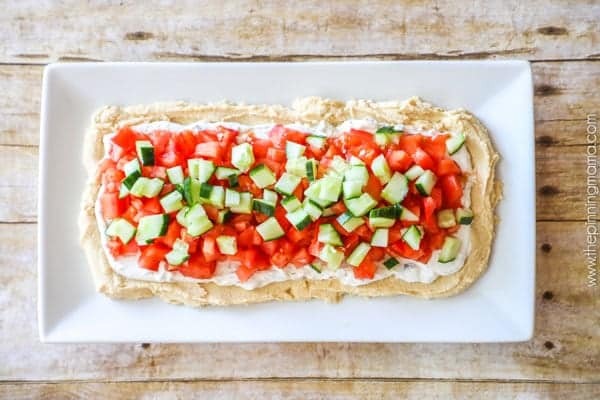 On a mostly flat platter or plate, spread the entire container of hummus out in a thin layer. Then spread about half of the container of tzatziki in a think layer on top of the hummus leaving about a 1/2 inch border of hummus. Next layer on the tomatoes, cucumbers, peperonchini peppers, olives, green onions, and feta cheese leaving a small border on each layer. Although this dip is best made fresh, you can make it ahead and chill for up to 3 hours before serving.